Our loft bed plans will help you stay hip. Loft beds are a savvy choice for any stage of life. Children love the playful nature of the ladder, and the extra space below to store toys and stretch their legs. Teenagers can use the added room for a computer, desk or study spot. Adults can even get creative. There are plenty of tasteful ways to integrate a loft bed into your room – try integrating your wardrobe and dressers into the design and making your loft into your walk-in closet. Go here to purchase plans. 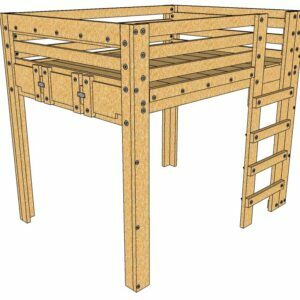 When you purchase one of our loft bed plans, you’re guaranteeing a solid foundation for your child. Our loft beds are built to last, and come with straightforward directions to ensure you shore up the construction from every angle. You don’t need to be a professional craftsman – our beds are sturdy and constructable for novices and experts alike. The queen loft bed plans can also fit a twin size mattress with room to store toys, clocks and other necessities. This approach will allow your child to start small and grow into the bed as he or she matures. It makes for a great value buy; your child won’t need a new bed for years to come! Every family is unique. Every household has its own rules, traditions and accommodations. Whatever your family looks like, our beds can adjust. The design is also flexible. As the years go on and you look for new projects, you may want to convert the loft into bunk beds or even a bed fort. 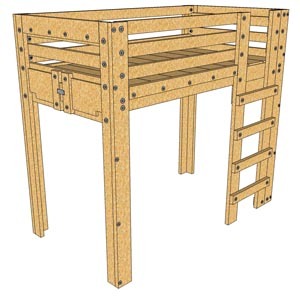 Our queen loft bed plans are just $10. Every plan explains all the materials, tools and motions necessary to build and assemble a high quality queen loft. Order with us online, and you can get started with your new queen loft bed as soon as possible. It’s fast, it’s easy, and it’s way less expensive than one of the pre-packaged sets you’ll find at the big box stores. Get your loft bed plans today!